The Conservative government is planning to change the current measure of child poverty, which combines income (60% median equivalised) and material deprivation (21 items commonly agreed as essential by members of the general public for adults and children separately, which are then combined to create an index of multiple deprivation). The proposed new child poverty measure would comprise commonplace family characteristics such as: family ‘breakdown’, ill-health, lack of skills, inadequate housing, ‘poor’ schools and ‘worklessness’. Let’s lay aside the fact that these characteristics do not distinguish between poor and non-poor people as they are experienced by many people at different points in the lives. Let’s also lay aside the fact that these dimensions do not measure poverty itself, but rather are risks, consequences or causes of falling into poverty. Let’s instead focus on what analysing income and material deprivation can tell us in relation to child wellbeing. It is worth briefly commenting on the background to the current child poverty measure. It was reached after a period of extensive consultation using research evidence. Not only has the 60% median equivalised income measure succeeded in capturing the effects of complex economic situations, it is also the official child poverty measure of the EU, OECD and UNICEF, and is now used by other governments.To change this measure now not only negates the considered and considerable efforts of many, it will separate UK child poverty from the rest of Europe and beyond. The government also risks being accused of changing the goalposts in recognition of its impending failure to reduce or eradicate child poverty. Let us turn our attention now to income, material deprivation and child wellbeing. The following chart is from my recent analysis of six waves of the birth cohort study Growing up in Scotland (See Figure 1 below) when the children are aged six years old. The red line with mean equal to 0 is the average of child wellbeing across all children in the study. Any positive numbers above this line shows higher than average levels of child wellbeing and any negative numbers below this line shows lower than average child wellbeing. 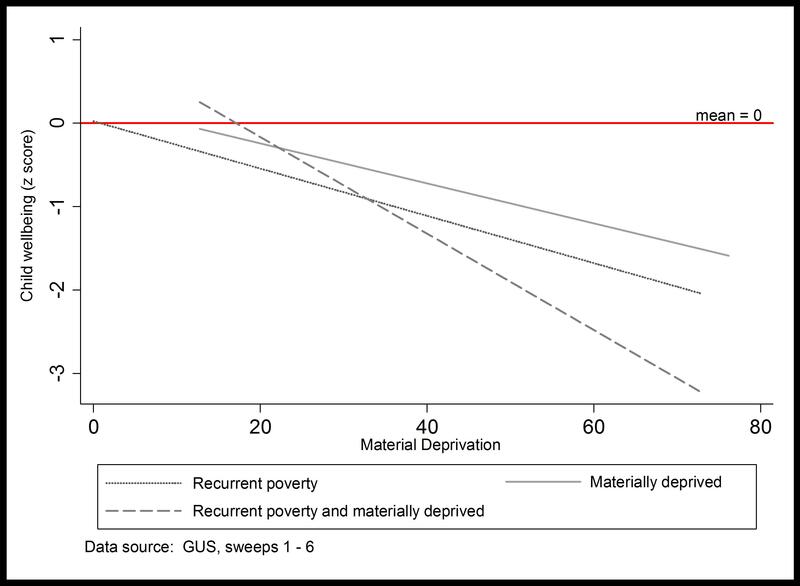 This chart shows that material deprivation (solid line) and recurrent poverty (dotted line) are each associated with lower than average child wellbeing; increasing levels of either income poverty or material deprivation result in increasingly low levels of child wellbeing. However, when both recurrent poverty and material deprivation are measured together (combined multiplicatively in an interaction term to be technical – dashed line), this results in exceedingly low levels of wellbeing for children, greater than either material deprivation or income poverty added together. This indicates that income and material deprivation while related, for the definition of material deprivation is not being able to afford consensually agreed necessities, are picking up on different aspects of economic disadvantage, which when combined, equal to more than the sum of their parts in their association with low levels of child wellbeing. This suggests that using both income and material deprivation in a measure of poverty is valuable and necessary. Another advantage to the current measure of income and material deprivation is that it is objectively measured and comparable across time and place. The proposed new components of child poverty, i.e. family ‘breakdown’, ill-health, lack of skills, inadequate housing, ‘poor’ schools and parental ‘worklessness’, do not distinguish between poor and non-poor people but result in a highly stigmatised and distressed group of people. For more details on how this index is created, and what the implications are of how the index is created, please refer to Treanor (2014). I have written about this more fully in a consultation response.